Mouse wants to go on an adventure to find the moon. He draws a map and enthusiastically sets off refusing Bear’s offers of help. All is well until the sky turns dark, mouse can’t see his map and the forest becomes quite scary. Then suddenly Bear is there to help and reassure him. But why does Bear decide to make a paper boat? And will they ever find the moon? Maybe not, but Mouse will find other wonders during his journey and discover he has a true friend in Bear. This is a beautifully written story about friendship and adventure with magical illustrations. The refrain makes it easy and fun for children to join in with repeated readings. 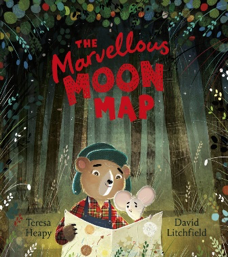 Look at the cover, read the first page then ponder together about what might happen in this story, how might mouse get to the moon? Read the next few pages, pausing at the cliff hanger in the forest, what might be hidden there? Then continue to read the book aloud to the end, talking about what is happening in the story and pictures when your child wants to. There are words in bold and large print to read loudly and emphasise. When you reread the story your child might like to join in with some parts, for example the chorus ‘I’ve got you and you’ve got me’ and the sounds in the forest. Talk about how mouse and bear feel at different parts of the story. Talk about anything that puzzles children for example, any new words such as ‘marvellous’. Talk about the moon, anything your child knows or would like to find out. Share favourite illustrations and parts of the story and look at these again. Look at all the space books and objects in Mouse’s house. Children might like to try some experiments with the boat, see suggestions below. Your child might enjoy drawing a magnificent, mighty, most marvellous moon map of their own, if possible on a large sheet of paper. Talk about it together when it is finished. Talk together about what might be needed to go on an adventure. Find a bag eg a rucksack and pack it with some of these things. Perhaps you could go on a real adventure with your supplies in a garden, park or forest. (Making sure you have a map of course!) Children might like to make a mini book about their adventure with drawings and writing – children beginning to write could do this themselves, for younger children you could write down their ideas for them. What did mouse hear in the forest at night? Can you make some night time noises together? You could use your body or voices or objects such as screwed up paper and twigs. You could make these noises when you reread and get to this point in the story or record your sounds, make the room really dark and play the recording, making sure you are close enough together so children feel safe. Find out some facts about the moon and the sun. Do some experiments with floating and sinking by making boats with different types of paper, which floats longest? What happens if you don’t cover the paper with crayon? See here for more floating and sinking experiments.